Lawton, OK- Lawton Public Schools teachers Dr. Jan Thomas, Tomlinson Middle School (K-8 Category) and Terry Brandenburg, Lawton High School (9-12 category) were named the 2018 Altus Air Force Association (AFA) Chapter 342 Teachers of the Year in their respective category. The Chapter also submitted Dr. Thomas as their nominee for the state recognition. During a school-wide presentation, Baldwin announced that she will represent the state as the AFA State Teacher of the Year and will move on as a nominee for the National Teacher of the Year. 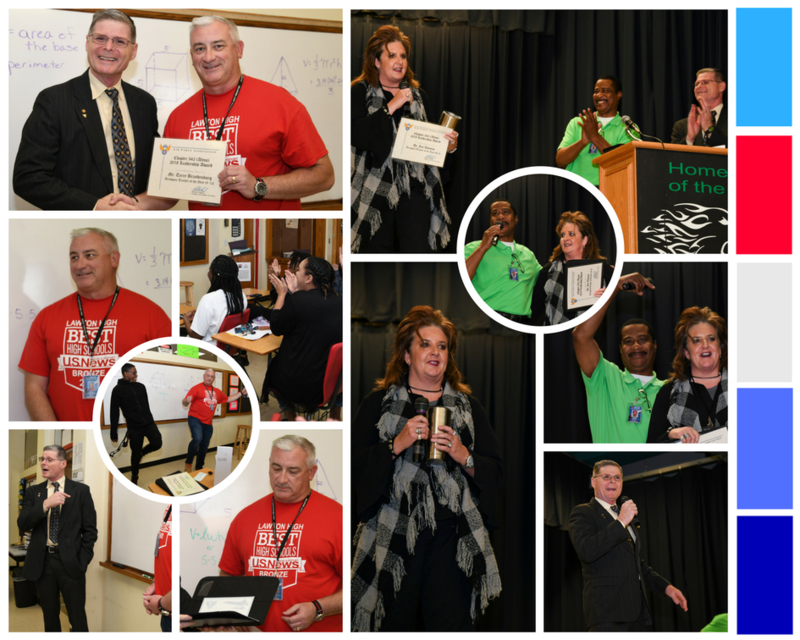 Baldwin presented accoutrements, an AFA Chapter membership and a $250 check to each teacher on Monday, April 23. Dr. Thomas will officially be recognized at the AFA Oklahoma Convention on June 23. If you are interested in learning about more AFA programs available for teachers and students, please visit www.afa.org. Congratulations Dr. Thomas and Mr. Brandenburg!